Hey little bud with that toothy grin that makes my heart beat differently than it did ten months ago! Yeah, you, with that perfect baby body and the sweetest cuddles. You there. You could have warned me. You could have given me a gentle nudge while you hiccuped in my belly. A nudge that told me these last ten months were going to redefine the word hard! You could have told me the fear I felt when your sister didn't cry out for me in the middle of the night any longer would be trumped by the fear I felt when you were sick and cried out in misery. You could have told me my heart would swell with love for you more quickly than your sister's and it would simultaneously ache while I watched hers catch up. You could have warned me that I wouldn't sleep for ten months straight. That I’d curse the woman I was before I met you – the woman who seemed to know it all about how to make a baby feel secure enough to sleep! 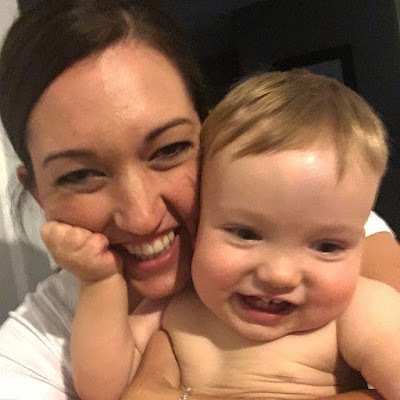 Frankly, you could have told me you'd be the catalyst for me to call everything I thought I knew into question... how to be a working mom, an effective wife and partner, and a nurturing parent. You could have warned me, bud, but I know I wouldn't have listened. Instead, as you have grown ounce by ounce, I have grown in patience and understanding. In the process of completing our family, you've helped complete me. My mind is more open and judgment comes slower now. I’m not perfect, but I’m thankful. You are a rare gift, Weston – the rainbow in the middle of the rain. And, I’m thankful for all the love, lessons and laughter you’ve brought to our lives.